Headlamps and Taillights are important safety features. It is important that a wheelchair user can see as well as be seen at night. This is especially important when crossing poorly lit intersections or driving through parking lots. The headlamp included in our lighting package is almost as bright as a car headlight. Lights are especially important for persons who live in the northern hemisphere when it gets dark early in the winter. 21st Century Scientific Lighting Packages feature a 24 volt 20 watt 1900lm CREE headlamp with a weather-sealed aluminum housing. 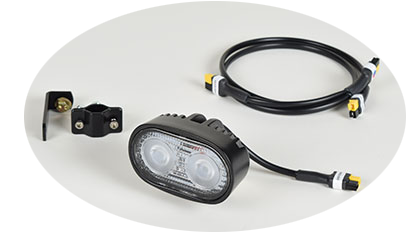 Each package has a switch box that can be mounted on round tubing and cables that will support one or two headlamps and taillights. A second headlamp can be purchased separately. The taillight assembly, pictured above, includes a sturdy metal case with amber side reflectors and two red taillamps. Current draw per headlamp: 0.46A @ 24V; taillight assembly: 0.30A @ 24V. 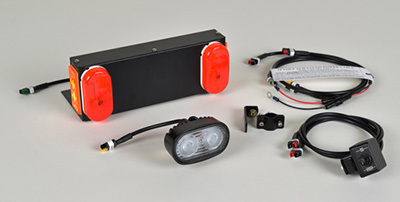 The lighting package can be installed on most 24V power wheelchairs by connecting directly to the battery terminals with a fused power cable. The Lighting Package can be installed on most brands of power wheelchairs such as Pride, Invacare, Quickie and Permobil. 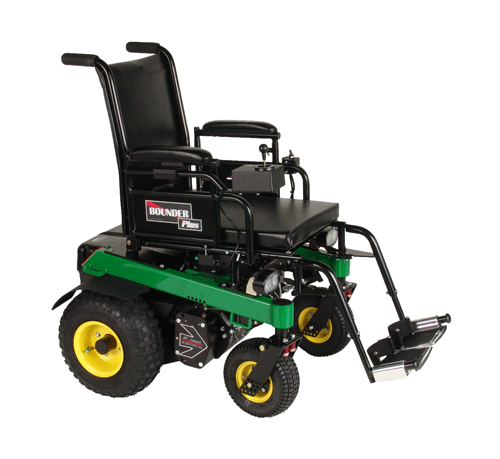 Each kit comes complete with wiring to connect directly to the wheelchair batteries or through an optional XLR power adapter that can be plugged into the charging port of the wheelchair. The Lighting Package is controlled through a toggle switch that can be clamped around any 7/8" or 1" diameter tubing. The taillights attach to the rear of the chair with the supplied velcro. On BOUNDER Plus and Big BOUNDER H-frames taillights are mounted in the rear of the H-frame base and are standard. If a headlamp is not ordered, the taillights turn on and off when power to the chair is turned on and off. If a headlamp is installed on the chair, a separate toggle switch is provided to turn both the headlamps and taillights on and off. Alternately, the taillights can be controlled through the Aux Switch (AS1) on the hand control separate from the headlight. A second headlamp can be installed to bring the total illumination to 3800 lumens.